Maxim Iglinsky dropped Joaquin Rodriguez and chased down Vincenzo Nibali to win the Liège-Bastogne-Liège on Sunday in Belgium. The Kazakh of team Astana rode solo up the 1.3-kilometre climb into Ans. The 257.5-kilometre monument stands out as the 31-year-old’s biggest win, easily topping Strade Bianche in 2010. Nibali of team Liquigas-Cannondale made his bid for the win on the Côte de La Roche aux Faucons, 19.5 kilometres from the finish. Iglinsky went around 11.4km, near the base of the next climb, the Côte de Saint-Nicolas with Rodríguez (Katusha). He dropped Rodriguez before the top of the climb and sat off in pursuit of the solo Italian. Nibali seemed to crack with three kilometres remaining. Iglinsky passed, took three seconds at one kilometre remaining and won by 21 seconds. His team-mate and Amstel Gold winner, Enrico Gasparotto won the bunch sprint for third. Daniel Martin (Garmin-Barracuda) placed fifth, Samuel Sanchez (Euskaltel-Euskadi) seventh and Ryder Hesjedal (Garmin-Barracuda) ninth. The pre-race favourite and last year’s winner, Philippe Gilbert (BMC Racing) took 16th at 1-27 minutes. Other riders finished in small groups, all cold and wet from the day in Wallonia. An escape of six riders dominated the first half of the race. Dario Cataldo (Omega Pharma-QuickStep), Simon Geschke (Argos-Shimano) and Kevyn Ista (Accent Jobs) rode free 38km into the race. They were joined by Gregory Habeaux (Accent Jobs), Alessandro Bazzana (Team Type 1) and Reinier Honig (Landbouwkrediet) at km 55, when the group was at 6-10 minutes back. The gap grew to 12-35, but dropped down to 9-05 by Bastogne. Katusha controlled the race for Rodriguez. Geschke crashed and had already abandoned his five companions on the Côte de Stockeu. RadioShack took over on the Stockeu with Andy Schleck, Chris Horner and Jan Bakelants. The trio had the gap down to 3-20 by the Haute-Levée climb. Pierre Rolland (Europcar) attacked after the climb at 81km out. 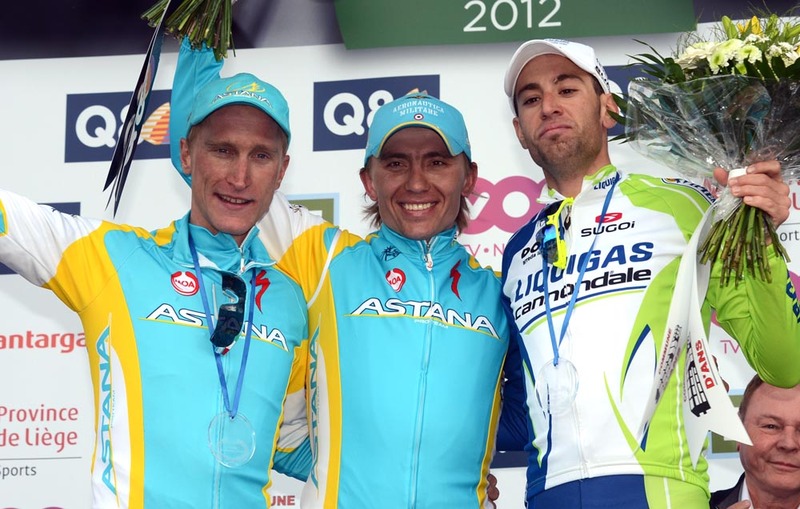 The Frenchman, winner on Alpe d’Huez, was joined by Vasil Kiryienka (Movistar) and David Le Lay (Saur-Sojasun). They bridged to the front five after the Col du Rosier. Several riders lost ground on the Côte de La Redoute, but Rolland remained solo until 20.2km to race. Former winner Alejandro Valverde (Movistar) had a mechanical on La Redoute and lost hope of repeating. The winning move, as in recent years, came on the following La Roche climb. Frank and Andy Schleck (RadioShack-Nissan) were out of contention, Nibali rode clear and Iglinsky kept watch.